Sofia Lövgren is enjoying a successful summer in Las Vegas, and it continued on Wednesday as she was grinding a deep stack on Day 2 of the 2016 World Series of Poker Main Event. “I’m mainly a cash-game player, so I combine live cash games with tournaments here in Vegas,” she told PokerNews. “I’ve played 10 WSOP events so far. I cashed in the Colossus and I made a deep run in the Millionaire Maker. I finished in 12th place and pretty much bubbled the final table, so that was a bit annoying. I lost a coin flip just before the final table, but yeah, that’s poker. The young Swedish pro has also booked two other cashes in WSOP events, collecting a total of $88,043 in live tournament earnings — a profitable haul in what was a comparatively light tournament schedule. The cash games have apparently been lucrative as well. The deep-stacked nature of WSOP Main Event has long been seen as advantageous to players used to a deeper cash-game grind. Lövgren said she certainly enjoys it. 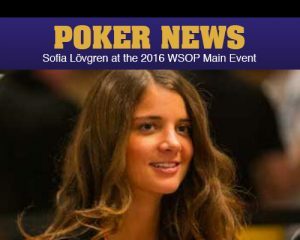 While it has been a bumpy ride, Lövgren said she’s happy with the way her 2016 WSOP Main Event is shaping up. “It has been going well so far,” she said. “I’ve been grinding lots of small pots actually. [On Day 1], I was down to 30,000 at one point, then I grinded up to 120,000, and finished the day with around 80,000. It was kind of a roller coaster day, but I was very happy with where I finished anyway, because I got away from some really tricky spots where I could have lost big chunks of my stack. Lövgren said her approach includes putting maximum effort into adjusting to the players around her, and protecting her tournament life. She also tries to live in the moment and enjoy the WSOP Main Event experience.